"Seeking a couple Elearning developers for a short project. 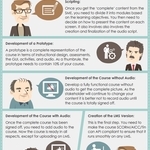 (1week - 1month) Good proficiency with Storyline 360 and Camtasia Contact: p..."
"Great work. Can you provide more details on how you did this? Did you use layers for the video and then the corresponding triggers?" "Hello Articulate Team, I've tried to upload to tempshare for about a week now and it uploads however when it gets to publishing the error..."